For long-lasting screen enclosures in the St. Paul, Minnesota, area, trust the experienced professionals at U.S. Patio Systems and Home Remodeling. We provide some of the best patio enclosures currently on the market and can also expertly install these top-of-the-line shade solutions. Plus, we offer two styles of TEMO screen enclosures to choose from, including the studio and cathedral. 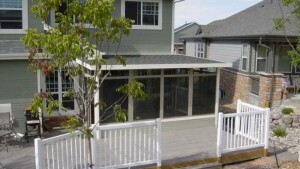 The studio screen enclosure is the perfect choice for single-story homes. The cathedral screen room comes with high vaulted ceilings for a dramatic look that is sure to impress. No matter which patio enclosure you choose, you can rest assured you will have a beautiful and comfortable space to enjoy. To learn more about the premium screen enclosures we have available to homeowners in the St. Paul, MN, area, contact U.S. Patio Systems and Home Remodeling today. One of our friendly specialists is available to answer any questions you have and can tell you more about all of the outstanding products and services we offer.